The unforgettable New York Times best seller begins with the story of two half-sisters, separated by forces beyond their control: one sold into slavery, the other married to a British slaver. Written with tremendous sweep and power, Homegoing traces the generations of family who follow, as their destinies lead them through two continents and three hundred years of history, each life indeliably drawn, as the legacy of slavery is fully revealed in light of the present day. YAA GYASI was born in Ghana and raised in Huntsville, Alabama. She holds a BA in English from Stanford University and an MFA from the Iowa Writers’ Workshop, where she held a Dean’s Graduate Research Fellowship. She lives in Brooklyn. "One of the most fantastic books I've read in a long time...you cry and you laugh as you're reading it...a beautiful story"
"It’s impossible not to admire the ambition and scope of “Homegoing,” and thanks to Ms. Gyasi’s instinctive storytelling gifts, the book leaves the reader with a visceral understanding of both the savage realities of slavery and the emotional damage that is handed down, over the centuries, from mothers to daughters, fathers to sons. At its best, the novel makes us experience the horrors of slavery on an intimate, personal level; by its conclusion, the characters’ tales of loss and resilience have acquired an inexorable and cumulative emotional weight." "Tremendous...spectacular...[HOMEGOING is] essential reading from a young writer whose stellar instincts, sturdy craftsmanship and penetrating wisdom seem likely to continue apace — much to our good fortune as readers." "Gyasi's lyrical, devastating debut more than deserves to be held in its own light.... Gyasi traces black history from the Middle Passage to the Great Migration and beyond, bringing every Asante village, cotton plantation, and coal mine into vivid focus. The rhythm of her streamlined sentences is clipped and clean, with brilliant bursts of primary color...the luminous beauty of Gyasi’s unforgettable telling. A–"
"Rarely does a grand, sweeping epic plumb interior lives so thoroughly. 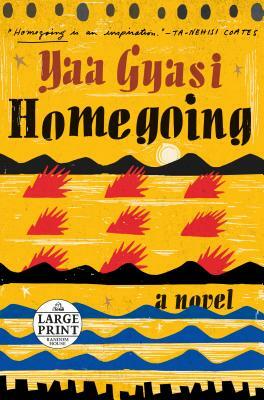 Yaa Gyasi's Homegoing is a marvel." "Stunning, unforgettable... Homegoing is an ambitious work that lives up to the hype." "Striking... With racial inequality at the forefront of America’s consciousness, Homegoing is a reminder of slavery’s rippling repercussions, not only in America, Gyasi points out, but around the world." "Each chapter is filled with so much emotion and depth and tackles so many different topics.... I didn't want to put it down." "Lyric and versatile . . . [Yaa Gyasi] writes with authority about history and pulls her readers deep into her characters' lives through the force of her empathetic imagination . . . striking . . . [a] strong debut novel." "Courageous . . . [Yaa Gyasi] approaches tough topics with unflinching honesty." "[HOMEGOING] lives up to the hype."